Pole House #25 is located between the Sunriver Village Mall and Fort Rock Park. 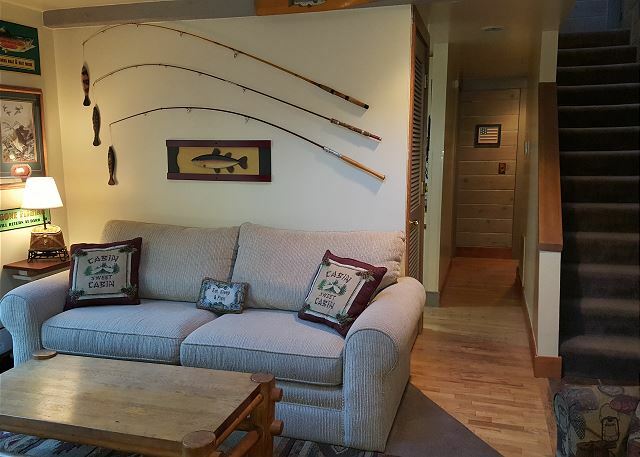 Invite up to 10 guests and your four legged best friend in this 1800 sq ft, 3 bedroom vacation condo! This 3 level home offers 2 separate loft areas. 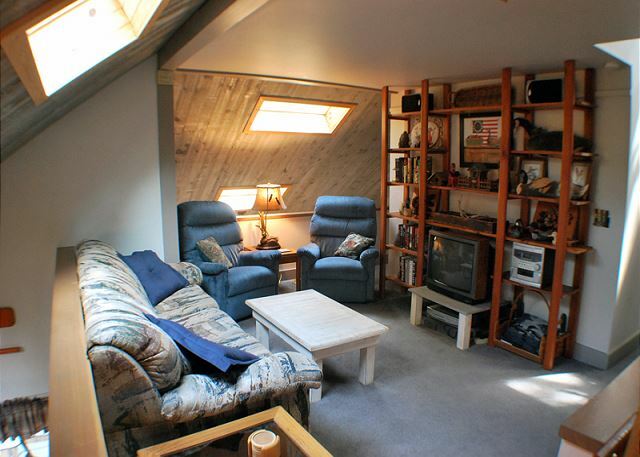 The main loft provides a hide a bed and 2 seating areas. 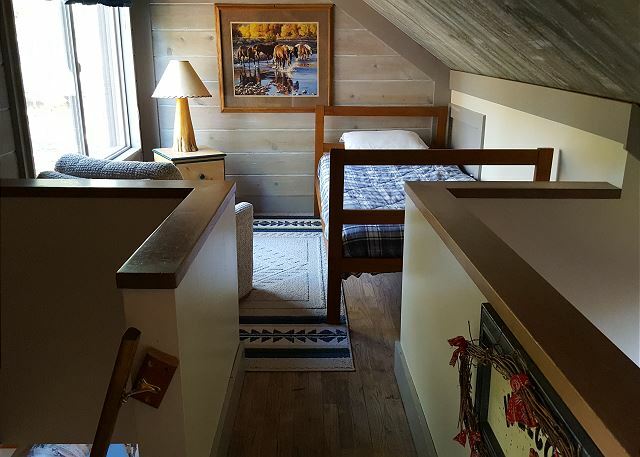 The 2nd loft (ladder access) has 2 twin beds…perfect for extra sleeping space. 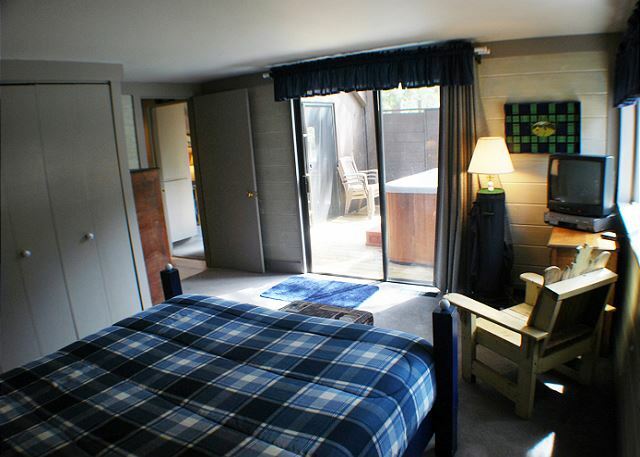 The 3 bedrooms have their own theme that is sure to create memories! 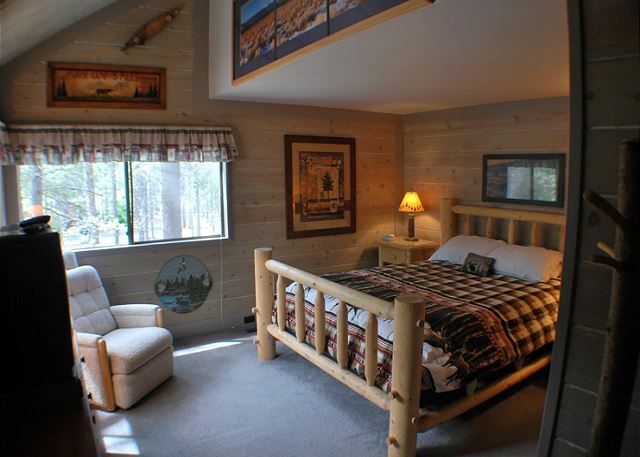 The Cabin Bedroom with a queen bed is the perfect Central Oregon/Northwest theme with a log bed and quilt comforter. 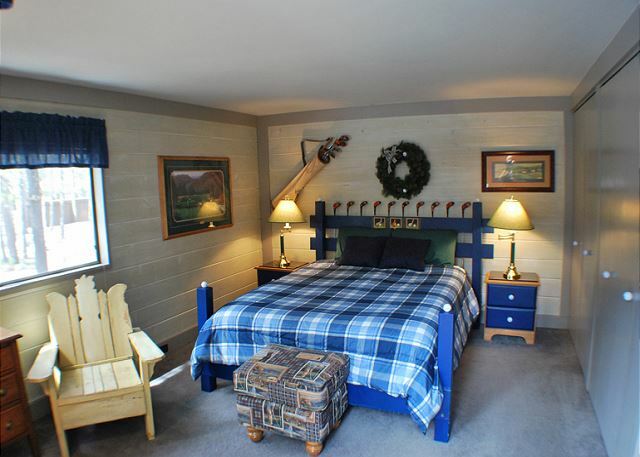 The Golf Bedroom is decorated with golf clubs and framed photos of endless green courses. Dream about golfing before tee time! 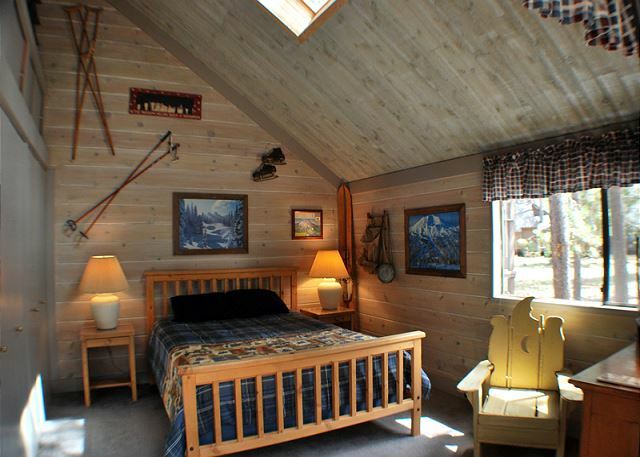 The Ski Bedroom with a queen size bed keeps you warm during Sunriver’s Winter Wonderland! The fully stocked kitchen leads to the dining area and living room with a gas fireplace. 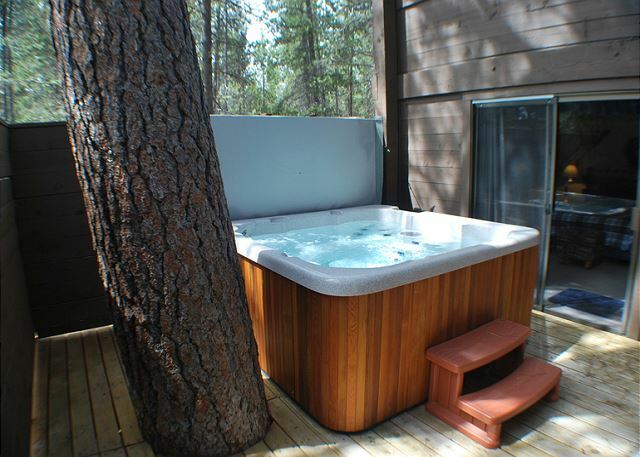 Relax in your private hot tub or grab the bikes and ride the Resort’s 33 miles of paved bike paths. 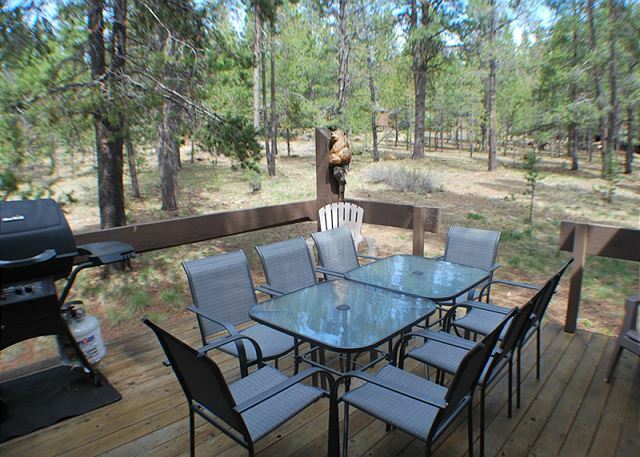 This home provides 8 Unlimited SHARC passes, free tennis and free access to the Sunriver Marina! 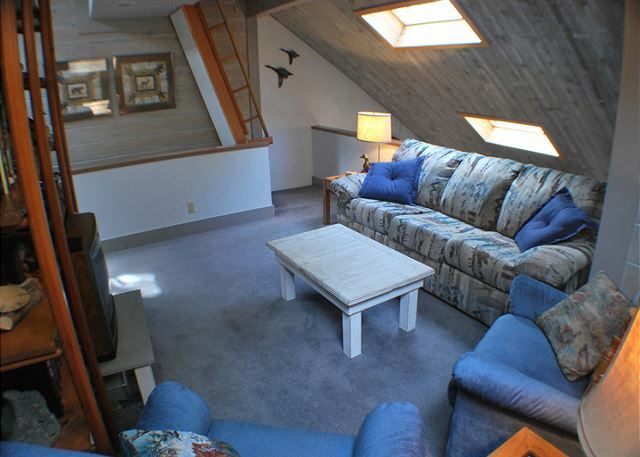 3 Queens, 2 Twins, 1 HAB, HOT TUB, 3 levels, D/W, W/D, microwave, 4TVs/4VCRs, DVD player, gas fireplace, 2nd loft - ladder access. DOGS ONLY, 1806 sq ft, 8 Unlimited SHARC passes. We traveled here with our 3 kids age 5 and twin 2 year olds. Loved the house and the location a half mile walk to the SHARC. The house was well stocked and clean, and the management company was very helpful. 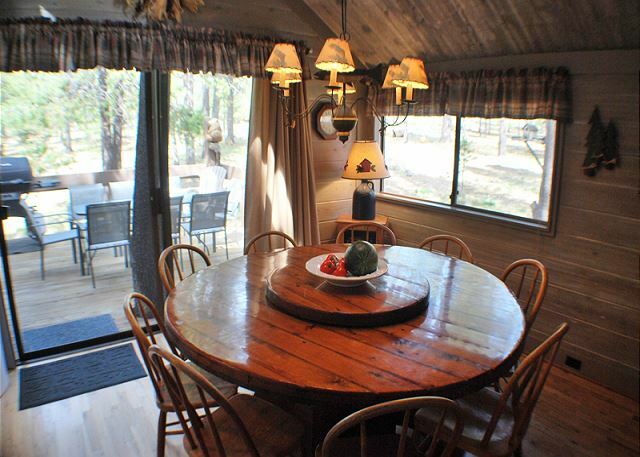 The house could easily accommodate multiple families, we had plenty of room with the 5 of us (plus our dog). My only complaint is that with young kids, it would be nice to have better locks on the doors. The locks are great to keep people on the outside from getting in, but the front door doesn't have any sort of dead bolt and the handle can't be locked. Same with the sliders, they all have locks on them that are not kid proof so we had to keep an extra careful eye to make sure our two year olds didn't get out unnoticed. Thank You for your 5 Star Review, Julie! We are happy to hear that you enjoyed this property with your family and found the location to be convenient and the home clean and well stocked! Come back soon! We had a great time at this house. It was very clean, and kitchen well-equipped for home cooking. Best aspect was its proximity to the SHARC and the 8 passes. Loading up the kids on bikes every morning and riding down to the pool was quick and fun. Only concern for kids is the loft area. If you have really young ones you will want to keep an eye on them. Also the carbon monoxide sensor is attached to the wall about 6ft high...those should be near the ground since the gas is dense and will sink to the floor. A simple fix for an otherwise good house. Thank You for the 5 star Review, Alexander! So glad to hear that this location was perfect for your group and that you found it clean, well-equipped and a great location...Come back soon! Rental house is cozy, clean, fun layout for kids and private space if needed. The hot tub is also great and kitchen has all the tools needed. Our only wish would be that the beds were comfortable. Thank you for choosing to spending you Christmas vacation at Pole House 25. We're glad your family enjoyed the layout and that you had everything you needed for your stay. You will be pleased to know that the owners have replaced the mattresses at Polehouse 25. We think you'll be pleased with the comfortable, new mattresses and hope you'll stay with us again soon! Thank you for your feedback. 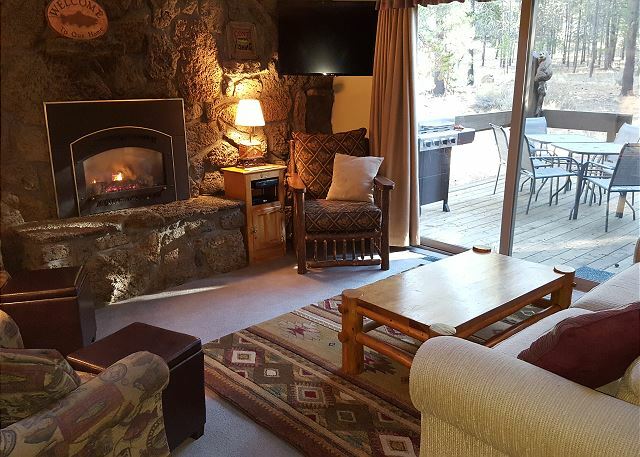 We look forward to welcoming you back to Sunriver! 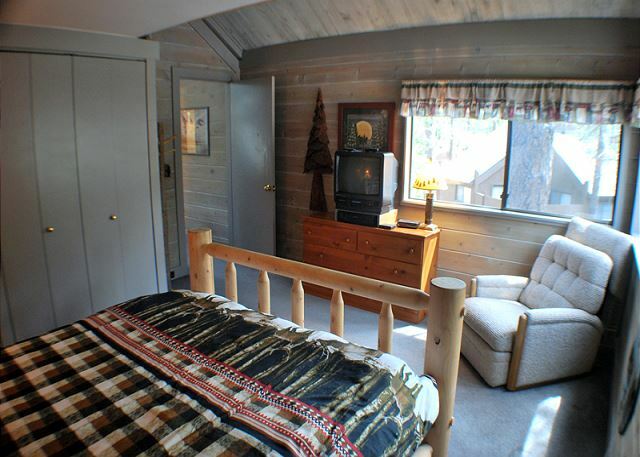 The house is conveniently located and is about 3 min biking to SHARC and 10 min to Village. The house is older but super cute. Plenty of space for two families. The layout does not allow for night time adult time without kids if you are using the lofts for them. My kids loved having their own loft space. The kitchen was stocked with most things you need. The kids liked the hot tub and having a washer and dryer were key. The big table fit us to eat which was also nice. Overall I would recommend this home!! Thank you for your review Rachel, we agree this home is in the perfect location and close to the Village mall & Sharc. Since the loft is not enclosed, the sound would carry and I understand it would be difficult to have little ones sleeping up there. 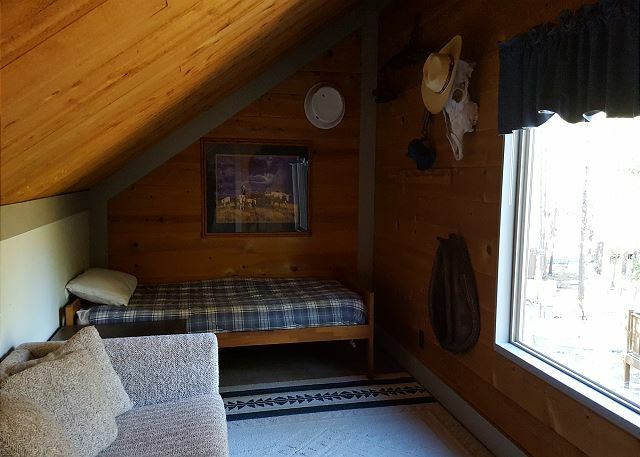 I would recommend one of the bedrooms next time and maybe the adult activities in the upstairs loft. We can't wait to have you stay with us again ! Time with family and lots to do. Participated in the Pacific Crest activities. Everyone had a great time. We are so happy that you had a great stay during Pacific Crest Weekend. It's one of our busiest weekends of the year, but indeed a great time! Thanks so much for the review and we hope you visit us again soon. We stayed at pole house 25 and it was very cute and a great place to stay. We stayed four nights and it was comfortable and well decorated. We're so glad you had a good time, Mike. I hope we'll get the chance to host you for many years to come. Hurry back to Sunriver! Overall this home was perfect for our large family of 6, plus extra child. 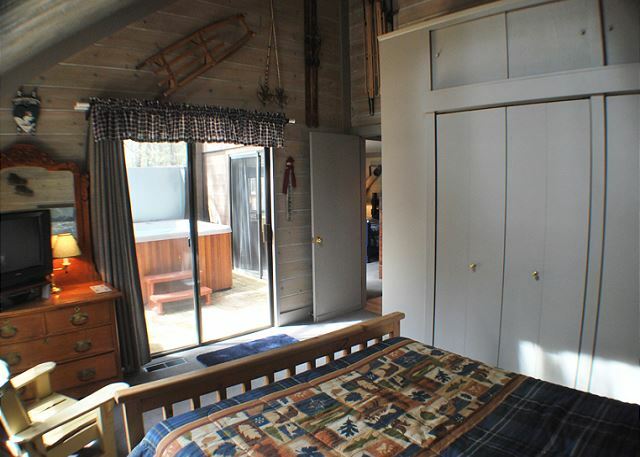 It's roomy and the lay out is perfect for our two youngest and our teenagers. The home is well stocked with essentials, but we were dismayed to find not one game or deck of cards in the entire home. We stayed in several homes and have always had games or cards to use. We were a little disappointed there. The beds were comfy but the sofa could be updated. It was not comfortable. But who spends a lot of time on the sofa? These are THE BEST kinds of suggestions, Craig! Just a simple, relatively inexpensive thing to add to the house that can make a world of difference. We'll get with the owners in the off season and suggest a few games and a deck of cards. We also want to invite you, *at any time you are staying with us* when these kinds of things are missing, to let us know while you are here because we often stock extra household items in our warehouse and LOVE the opportunity to enhance our guests' visits with these kinds of 'loaner' items. 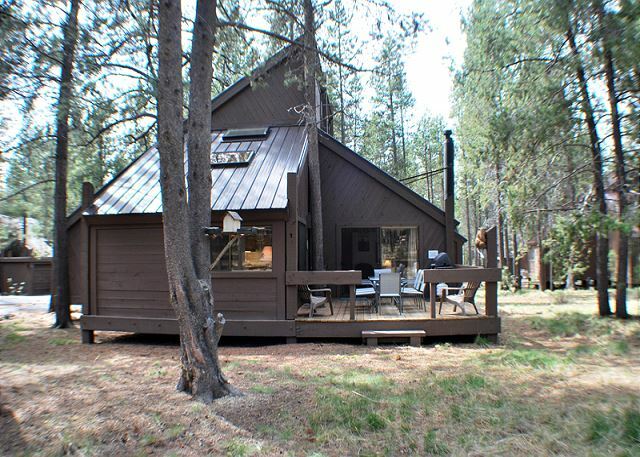 We hope you can get back to Sunriver soon. Stay here if you want a convenient, clean and cute place to stay! This house is perfect for a larger family and its decorated very cute and it was clean. The hot tub on the deck is awesome and relaxing! Love the location of the house to the village and SHARC since its a fast bike ride or drive! Definitely recommend this property to anyone! Thank you, Bethany! 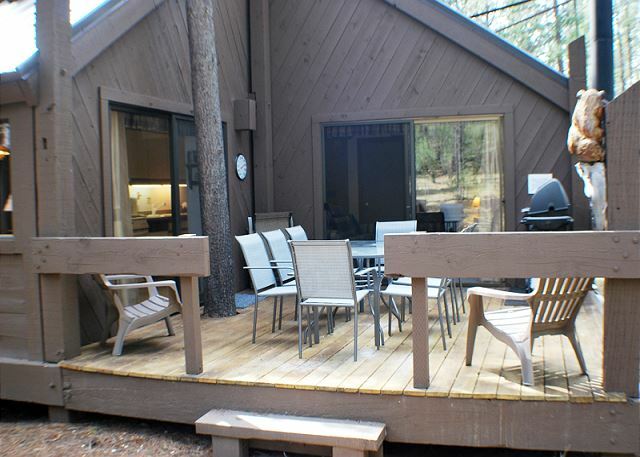 We look forward to your return to Pole House 25 and Sunriver! We did it all and had a great time! Property was clean and as described. Amazing location for the kids (SHARC and Village on one side Fort Rock amenities on the other and a short ride to the Marina). One of the bikes was broken so the management Co brought us another one great customer service. Great experience all around. Very Satisfied! Thank you for this great feedback, Joe! We are really trying hard to give our hard working families the best visit ever! (and the SHARC sure does help with that!) We've seen quite a few next-generation 'Sunriver Summer Locals' this year (guests that visited as kids and now visit with their kids). We'd love to be a Kessi family tradition! We had a great time! House was very clean just a couple little things, the stove burners were not connected all the way and a few of the lights were burned out. Thank you for letting us know. We are glad you had a great time! 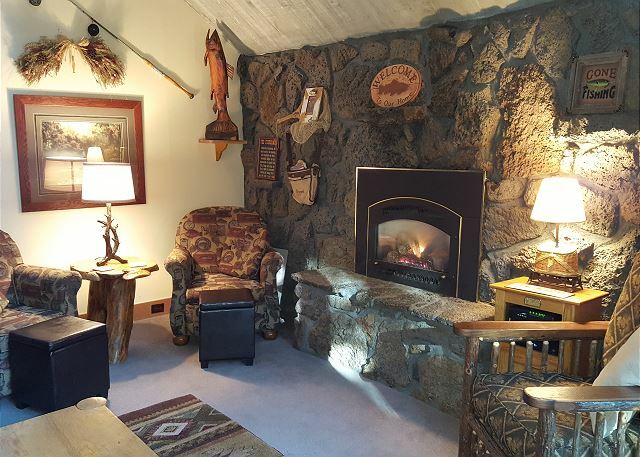 a guest from Redmond, Washington does not recommend this vacation rental. Thanks for choosing to stay with us. Glad to hear you enjoyed the home. Had a very good time at Sunriver. House had everything we needed for our stay. Maintenance service was very good when we needed it.